Biography: Blessing for Integrated Rural Development Society or BIRDS is a social working group, helping poor and hungry families, the sick, disabled, those with leprosy, and families affected by HIV and AIDS. They also help the semi-orphaned and orphaned children, and teach people to earn a living through a self-help groups. Within BIRDS, Sanjeeb and Rashmi work with nine other ministries, all of which have churches. Sanjeeb and Rashmi also pastor a church named Covenant Reformed Presbyterian Church which has a nursery program that has helped open a nursery school, several children's ministries, and an active youth program with a youth club used to reach unreached areas and families. Every month, they hold a seekers seminar while also holding leadership seminars, group discussions, prayer meetings, and counseling meetings. Their vision is to bring the gospel to all the unreached areas where there is no transportation or no one to visit the village with the gospel. 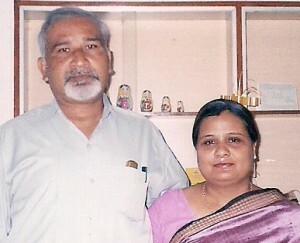 Strengths: Sanjeeb and Rashmi are gifted administrators who show God's love to all in need. Family: Sanjeeb and Rashmi have two grown children, Aneesa and Amos David.